This is the year 25-29 competitive renewal of the UNC Breast Cancer SPORE, one of the original 1992 SPOREs, which has contributed key findings in breast cancer translational research in minority disparities, genomic analysis, molecular subtyping and therapeutic resistance, while advancing new technology and developing junior faculty into translational research leaders. The constant since 1992 is a population- based, biospecimen-rich, epidemiological and clinical infrastructure, the Carolina Breast Cancer Study (CBCS). CBCS Phase 3 has finished accrual of an additional 3,000 cases and embarked on a ten-year follow- up with treatment, adherence, and outcome data. CBCS oversamples African Americans (AA) and patients aged 50 or younger to provide one of the largest population-based studies of age and race disparities. CBCS has made seminal contributions to our understanding of triple negative breast cancer (TNBC) and other breast cancer subtypes in North Carolina’s AA population with over 150 papers published. For example, our SPORE has published articles characterizing Basal-like TNBC that have been cited over 23,000 times. With substantial institutional investment, the UNC SPORE: i) Incorporates new technology and novel methods; ii) Develops infrastructure that provides new directions; and iii) Promotes career advancement for junior and mid-level faculty from the population, basic and clinical sciences. In the last 5 years, the CEP and DRP produced seven Komen Catalyst Awardees. The CEP brought 13 new faculty to the SPORE, 5 of them women and 3 minorities. The DRP funded collaborative projects between: engineers and clinicians to produce unique instruments and methods for early detection; immunologists and geneticists to study breast cancer immune infiltrates and responses; and outcomes researchers, clinicians and programmers to create new databases to study breast cancer care delivery in North Carolina. With EAB and Executive Committee input, the multi-PIs Chuck Perou and Shelley Earp with clinician co-lead Lisa Carey selected 4 projects for this revised renewal, focusing on minority disparities, developing a new understanding of resistance to immuno- and chemotherapies, and developing novel, clinically practical, predictive biomarkers. Project #1 – The Carolina Breast Cancer Study (Troester, PhD and Carey, MD, MSc) will explore biologic and genomic differences in AA (1500) and white (1500) tumor specimens relating those to multiple patient-level parameters. Project #4 Therapeutic Approaches to the Adaptive Chromatin Remodeling that Underlies Resistance (Johnson, PhD and Earp, MD). Black women suffer higher incidence of poor-prognosis breast cancer subtypes and worse stage-specific mortality. Our previous Carolina Breast Cancer Study(CBCS)-based SPORE discoveries have integrated population-based epidemiology with tumor biology to demonstrate that young black women are more likely to develop Basal-like tumors. More recently, we found that black women also have higher frequency of Luminal B and HER2-enriched breast tumors. Furthermore, even among the best-prognosis clinical subset of estrogen receptor (ER)-positive/HER2-negative cancers, black women have higher risk of recurrence (ROR) scores. These findings implicate tumor biology as a key contributor to racial mortality disparities. Some tumor factors (i.e., higher frequency of HER2-enriched subtype) may be targetable, illustrating how population-based genomics can advance precision medicine. In this Project, we propose to deepen our understanding of racial differences in tumor biology, etiology and progression, with a focus on tumor mutational signatures and immune responses. The frequency of specific mutations (i.e. TP53, PIK3CA), and the overall patterns of somatic mutations (mutational signatures) can be informative about the underlying biological processes that have gone awry from the earliest stages of carcinogenesis. In addition, new discoveries have emphasized the importance of the immune system in breast cancer etiology and progression. With our rich resource of tumor biospecimens (exceptional 96% tumor procurement from 3000 cases), we will sequence tumor DNA and identify mutational signatures in black and white women (Aim 1) and we will characterize tumor immune microenvironments using six immunohistochemical markers and RNA profiling for 50 genes (Aim 2). While The Cancer Genome Atlas (TCGA) has evaluated racial differences in tumors with hundreds of thousands of data points per patient, limitations included small numbers of black participants (CBCS is ten-fold larger than TCGA), a sampling scheme that was not population-based, and lack of detailed covariate and follow-up data. TCGA advances have allowed us to increase sequencing efficiency for population-based work and have helped in developing an efficient RNA panel for immune profiling, resulting in a plan for cost-effective collection of mutational signatures and expression profiles in 2000 women (1000 black, 1000 white, sampling from the entirety of CBCS). Utilizing these advances in the context of the CBCS, we hypothesize that mutational signatures and immune responses are differentially associated with race, age, and breast cancer subtype. We also expect to identify some mutational signatures that vary as a function of immune profiles. The tumor biological variables collected in Aims 1 and 2 will be assessed as predictors of breast cancer recurrence and survival. In addition, impact of tumor biology may be confounded by other patient-level factors such as socioeconomic status, access to care, treatment delay and treatment adherence. Multivariable modeling (Aim 3) will identify the relative strengths of tumor biology and patient-level features that contribute to survival, thus allowing for impactful precision medicine strategies. Breast cancer is the second leading cause of cancer mortality in women and nearly 75% of breast tumors express estrogen receptor-a (ER) at the time of diagnosis. It is estimated that about 30-40% of ER+ breast tumors become resistant to hormone therapy, either through de novo or acquired resistance. Recent evidence suggests that inflammation plays a key role in promoting pathogenesis and acquired resistance to hormone therapies, and is considered a risk factor for breast cancer. 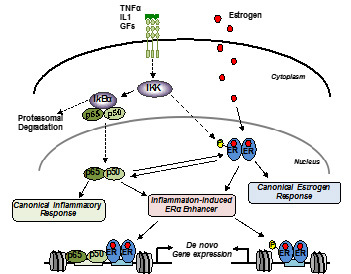 To this end, we and others have uncovered an important mechanism linking inflammatory signaling to endocrine resistance in breast cancer through interactions between the ER and NFkB, via cytokine-induced phosphorylation of ER and direct modulation of the ER pioneer factor FOXA1. This is important because greater than 80% of the lymph node metastases and 65–70% of distant metastases arising from ER+ primary tumors retain ER expression at the time of relapse. Also, inflammatory mediators, such as cytokines like the tumor necrosis factor alpha (TNF) or the master transcription factor NF?B and its upstream regulator IKK, are highly present in breast tumors and increase with tumor grade. Aim 1:Define the transcriptional changes and chromatin binding profiles of ER and NF?B in primary human tissues in response to E2 and proinflammatory cytokines. Aim 3:Define prognostic signatures, identify biomarkers and measure prevalence of inflammation-based modulation of ER function across patient samples. Triple-Negative Breast Cancers (TNBC = negative by clinical assays for ER, PR and HER2) are among the most clinically challenging because of their inherent aggressive biology and lack of treatment options, which is typically limited to chemotherapy only. These tumors are more common in African American women and young women, and contribute to racial outcome disparity differences. To advance our knowledge of the biology of TNBC, we believe it critical to precisely define the biological entities that are present within this known heterogeneous group and to determine what is the driving biology. This should then allow us to identify robust biomarkers of response for the most relevant therapeutics that are, or might be, used in the breast cancer clinic for TNBC patients. TNBC are composed of multiple disease subtypes including Basal-like, Claudin-low/Mesenchymal, and Luminal-type tumors. We propose a divide-and-conquer approach where we will first use a biomarker strategy to segregate TNBCs into these more homogenous biological subtypes, and then target a key feature, or features, of each subtype in order to make advances for personalized medicine. For TNBC patients, chemotherapy treatment is still quite effective for many; therefore, we will continue our studies aimed at identifying the most chemotherapy responsive subset of TNBC patients. Many TNBC patients have tumors with sizable immune cell infiltrates as demonstrated by us and others. The presence of intra-tumor immune cells predict a better prognosis, and we hypothesize this feature might also predict the benefit of immune oncology directed agents as well. We propose to test this hypothesis and if successful, identify biomarkers for chemotherapy and immune therapy responsiveness in TNBC patients in order to deliver these drugs to the subset of patients whom would benefit the most. Triple Negative Breast Cancer (TNBC), which includes Claudin-low (CL) and Basal-like Breast Cancer (BL), exhibits frequent TP53 mutation and large-scale copy number changes. Genomic changes also result in nearly 80% of BL having MEK/ERK pathway activation, yet targeted agents have not been effective in TNBC, and chemotherapy remains the option for recurrent disease. 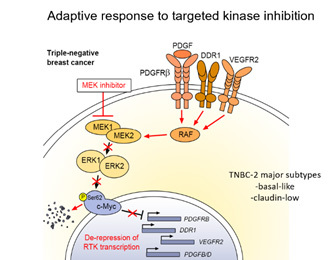 We have shown in TNBC that targeting signaling nodes crucial for tumor growth, such as MEK/ERK, elicits rapid upregulation of alternative kinase networks contributing to escape from growth inhibition. This adaptive kinome remodeling is distinct from the time-dependent selection of pathway mutations/amplifications that constitute a well-studied resistance mechanism in multiple tumor types. Pharma is beginning to overcome some of these mutations with 2nd and 3rd generation agents, but we don’t have answers for adaptive reprogramming. Our data show that adaptive reprogramming after trametinib (MEK inhibitor) and entinostat (HDAC inhibitor) in TNBC and laptinib in HER2+ disease result in slightly different, but widespread, transcriptional upregulation of multiple kinases making combination therapy with multiple kinase inhibitors impractical and potentially toxic. The mechanism underlying the transcriptomic changes are driven epigenetically with de novo enhancer formation and dramatic genome-wide enhancer and promoter remodeling. 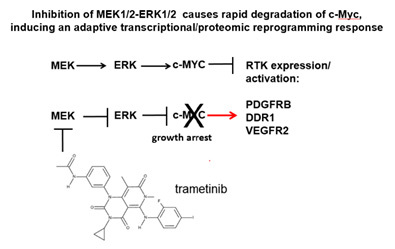 Enhancer remodeling is not restricted to MEK inhibition; we have observed adaptive reprogramming in response to inhibitors for AKT, PI3K, HDACs (entinostat) and receptor tyrosine kinases. Importantly, using a 7-day trametinib window trial in TNBC patients we demonstrated that adaptive kinome reprogramming is recapitulated in patients. Lastly our recent data show that bromodomaim inhibitors can both prevent and reverse the epigenetic changes working as the root cause of adaptive reprogramming. Our objective is to, for the first time in patients with TNBC, establish the occurrence of rapid epigenetic reprogramming thereby developing the rationale for combination trials of clinically advancing BRD4 inhibitors with either trametinib or entinostat. This could restore targeted therapies to TNBC treatment. Aim 1: Determine MEKi (trametinib) and HDACi (entinostat) induced alterations in enhancer function, chromatin remodeling, and gene expression driving adaptive bypass resistance in TNBC PDXs, PDX-derived primary cells and GEM models by analyzing genomic, epigenomic and protein acetylation. Aim 2. Use BRD4 inhibitors to determine efficacy in preventing and reversing adaptive resistance to trametinib or entinostat using Aim 1 TNBC models testing the ability of combinations to induce and maintain regression. Aim 3. Use two window trials to obtain pretreatment and 7-day biopsies and analyze selective effects of trametinib vs entinostat on enhancer remodeling and transcriptional changes in TNBC patient tumors comparing the patient response to primary cells from the same tumor. The results would form the basis for future Phase 1/2 trials using trametinib or entinostat combinations with clinically advancing BRD4 inhibitors. The UNC Breast Cancer SPORE Administrative Core has supported the infrastructure, planning, and evaluation of the UNC Breast SPORE since 1992. The Administrative Core and its leaders Earp, Perou, and Carey are responsible for the institutional long-range plans and resource commitments of the Cancer Center’s largest translational portfolio. The functions of the Administrative Core include organizing weekly leadership meetings, monthly SPORE faculty scientific meeting, quarterly Executive Committee and Advocate meetings and the yearly External Advisory Board. The Core collates formal reports to evaluate the progress of all SPORE elements, projects, pilots and career development and mentorship. The Core facilitates interactions with the NCI SPORE program and other NCI SPOREs, as well as multiple breast cancer research collaborations both nationally and internationally. The Core manages the Career Enhancement Program, including conducting external and internal searches for talented potential SPORE investigators; and the Developmental Research Program, including organizing the pilot project competition and facilitating funding and evaluation of DRP projects. The Core follows the accrual to clinical trials and the data on the breast cancer care population including minority accrual. The Administrative Core manages the finances of the SPORE including the substantial institutional commitment to projects, infrastructure and recruitment allocated to leadership, approaching $8M over the last five years as well as the $7-8M commitment for the proposed 5-year renewal. The Core implements the results of evaluations. Through these activities, the UNC Breast SPORE Administrative Core supports an exceptional team of breast cancer translational researchers as they explore and address minority disparities research, genomic analysis, molecular subtyping and therapeutic resistance, while advancing new technology and developing junior faculty into translational research leaders. Core B, Biostatistics & Bioinformatics, will be led by Joseph G. Ibrahim, Ph.D., Joel S. Parker, Ph.D., and Steve Marron, Ph.D. The services of this Core include RNA and DNA sequence data management and analysis, biostatistics, methodological development, and computational infrastructure. The capabilities in this arena at UNC Lineberger and the UNC Gillings School of Public Health are nation-leading. This SPORE Core is the most closely allied with the LCCC Bioinformatics Shared Resources and builds upon its strengths. Core B will consist of investigators from the LCCC Bioinformatics Shared Resource led by Dr. Joel Parker, and the LCCC Biostatistics shared resource lead by Dr. Joe Ibrahim. Core B bioinformatics will be co-led by Joel Parker and Steve Marron, and assisted by Andrew Nobel and Katherine Hoadley. This group has developed and applied data processing and analysis methods that are widely used across the world. Drs. Hoadley and Parker remain key participants in the broader TCGA project having been vital authors on multiple TCGA papers. Senior statisticians Drs. Marron and Nobel began working on genomic analysis in 2001, and have been involved in analytic and methods development ever since. They are closely collaborative with the head of the LCCC Biostatistics Shared Resource, Joe Ibrahim, PhD. He has led this Core for the past 5 years, and biostatistician Dr. Bahjat Qaqish has been involved in this SPORE since the initial 1992 submission. Additional key biostatistics personnel including Naim Rashid, who bring expertise in genomics and ChIP-seq to this Core. The combined experience and ability of the LCCC Biostatistics and Bioinformatics Shared Resources will be available to all projects in this SPORE. The funding for this SPORE Core B is for specific participation in the four projects and to provide advice and analysis capabilities to Career Awardees and those developing pilot projects. The UNC Breast Cancer SPORE Tissue Procurement & Pathology Core (TPP) Facility is a multifunctional facility, comprised of multiple components including Tissue Procurement and Translational Pathology. This Core provides centralized, quality controlled, quality assured procurement, processing, analysis, storage and distribution of normal and malignant breast tissue, blood specimens and other human specimens in support of basic science, translational, genomic, population and clinical trial cancer research. In addition to tissue and blood procurement services, the facility performs extraction of high quality DNA from whole blood, peripheral blood mononuclear cells, buccal smears and mouth rinses and immortalization of breast cancer patient lymphocytes. Importantly this group provides functional access to many other scientific and administrative groups such as Immunogenetics and Analysis and the Office of Clinical Translational Research. The Lineberger Data Warehouse (Core B), an Oracle-based, customized user-friendly database, operating on an honest broker model to protect identity and confidentiality, provides the infrastructure to monitor and survey each specimen and associated information. This provides a coordinated system of quality control, sample tracking and distribution of specimens to appropriate investigators. Breast cancer-specific efforts that have and will support SPORE aims include centralized tissue and specimen banking, receipt and processing of breast-related human specimens including: freshly procured, snap-frozen and formalin fixed paraffin embedded (FFPE) block specimens, preparation of tissue microarrays (TMAs), cell microarrays, morphological evaluation and morphology-based assays (immunohistochemistry, immunofluorescence, in-situ hybridization, and fluorescence in-situ hybridization), assay development & training, and digital imaging and image analysis for spatial quantification of molecular analytes in intact specimens. Project # 1, CBCS, has used the core for over two decades. Projects #2, #3, and #4 will specifically use the cores for samples from clinical trials (Projects #3 and #4) and to obtain fresh tissue to flow sort cells for assays (Project #2) and to prepare primary cultured cells from individual patients (Projects #2 and #4). The long-term success of national efforts to reduce breast cancer incidence and mortality rests in part on the ability of Breast Cancer SPORE programs to attract and build the translational research careers of talented young faculty. Since 1992, the UNC Breast Cancer SPORE has used career development funds to promote the breast cancer research careers of selected investigators. The SPORE Career Enhancement Program (CEP) both recruits externally and identifies internal faculty with interest in translational breast cancer research. The CEP then matches junior faculty with training offerings and senior mentors. We seek to enrich the field with our efforts to recruit qualified women and minorities as both participants and mentors in the program. Over the 24 years of the program recruits funded by the CEP include 17 women and six minority faculty (three African Americans, three Hispanic). Co-recruitment with departments across campus attracts exceptional talent to UNC and its Cancer Center. The SPORE CEP makes available extended training for junior faculty with an interactive group of respected and successful investigators who can influence and help build careers. The combination of an excellent talent pool and an effective training and mentoring program has resulted in an elite cadre of breast cancer researchers whose work contributes to the national breast cancer effort. Over the last six years the CEP has attracted 13 participants; five were women and three were minorities. We are particularly pleased that six of the 13 recruits were named Komen Career Catalyst Scholars (as was one DRP Awardee) and several have already been funded by NCI. These CEP participants’ contributions include published research, funded grants and collaborative breast cancer research across the spectrum of population, basic, clinical and translational research. Over the course of the CEP program a number of participants have become SPORE leaders. These include Bob Millikan, who developed CBCS; Charles Perou, Multi-PI and co- leader of Project 3; Lisa Carey Co-program head and co-leader of Projects 1 and 3 and the Career Enhancement Program; Melissa Troester, co-leader of Project 1; Carey Anders, clinical trial leader of Project #4; Claire Dees co-investigator on Project #2 and Katie Hoadley co-investigator Project #1, #3 and the Bioinformatics / Biostatistics Core. Over the next five years, the UNC Breast Cancer SPORE will continue to promote and develop careers in translational breast cancer research. The UNC Breast Cancer SPORE requests $50,000 to support career development. These funds will combine with $400-600,000 yearly in institutional funds to provide for recruitment and career development of faculty in translational breast cancer research. The SPORE leaders will continue to identify, recruit, and develop minority and women faculty. The UNC Breast Cancer SPORE Developmental Research Program (DRP) has promoted novel breast cancer research across the population, translation and clinical arenas. The highly successful Program includes mechanisms for stimulating grant applications, rigorously evaluating proposals, selecting projects with advocate input, and monitoring progress. Shelton Earp, MD, UNC Breast SPORE Multi-PI and Director of UNC Cancer Care oversees the DRP with process and evaluation assistance from Anne Menkens, PhD, UNC Lineberger Assistant Director. Application mechanisms include Cancer Center-wide competitive awards and rapidly emerging opportunities. Evaluation and selection processes include independent peer review, another level of external review and research advocate committee review. The SPORE Multi-PIs with input from Dr. Carey and the Executive Committee, make final decisions regarding selection and budget. Over the last year we have expanded a pilot process of solicitation to three UNC system Universities, our U54 minority serving institution partner, NC Central University in Durham; our sister public medical school at East Carolina University, and our large sister institution in Raleigh, NC State University, with its emphasis on Engineering statistics, veterinary medicine and cancer biology. The UNC Breast SPORE DRP has demonstrated productivity in multiple cycles of Breast SPORE funding based upon the success of the awarded projects. Over the life of the program, we have funded 87 projects. The number and funding has increased with the last decade’s submissions due to increased institutional commitment to the Breast Cancer SPORE. This over $2M yearly institutional investment in the Breast SPORE DRP has allowed funding emerging opportunities, including support to plan and then launch CBCS Phase 3 in 2008. Similar large investments were made in genomic infrastructure led by Dr. Perou that made us competitive for and eventually a lead site for the Breast Cancer TCGA Working Group. In addition, UNC Lineberger, with the SPORE Career Enhancement Program, has continued to build the faculty with a breast cancer interest across the population, basic, clinical and translation spectrum, increasing the pool of applicants for the DRP in addition to attracting other UNC Lineberger members to breast cancer research. During the past 5 years, the program funded 30 projects, bringing the total to 87 projects since the SPORE inception. As in past years, DRP projects have fueled new directions in full SPORE projects as well as seeding extramural funding from non-SPORE sources and resulting in important publications and new project directions.